Note: This is an absinthe microdistilled by Philadelphia Distilling (who also make Blue Coat Gin). First Impression: Complex and very aromatic bouquet to it. Wormwood, fennel anise, coriander, cardamom, bay (?) a little mint orris, iris, citrus/lemon balm. Very nicely balanced and complex. Appearance: Clear, bright, pond scum green with a touch of yellow – which is actually the color it should be -this is an indicator of natural chlorophyll which is a expensive and tricky thing to do. Not one of those colored with dyes a good honest color. On swirling, leaves a thin coat on the glass with scalloping and very thin legs developing. Some sedimentation in bottle but lends authenticity – rather see that then something filtered and proceessed to death – much like non chill filtered whiskey I’d rather sacrifice a little potential appearance for taste. Also tells you they used real herbs, not oils. Nice louche with water- a bit more opaque than some I have seen lately – which speaks well to the amounts of herbs used. Nice swirling and separation when you start to drip water then the louche kicks in and the absinthe starts to opalesce. Taste: Full strength it is quite drinkable for its’ proof- which is another show of its quality – even if I don’t recommend the practice. We try everything at original strength here so you don’t have to! Properly diluted (4 parts water to 1 part Vieux Carré according to taste) the anise and wormwood chase each other and coat the tongue for a long but pleasnat finish. Reminds me of some of the very good pastis I’ve had in Provence. Well made and full of flavor. You don’t need much sugar with this one -but neither does it strike you as heavily sweetened just nicely balanced in the herbal department. Drinks: The French absinthe ritual involves water fountains, sugar, spoons, and you pour the absinthe in the glass, then put the spoon over the glass put a sugar cube on it and drip water from a purpose built fountain over until it louches (opalesces, turns cloudy, etc.) and the right amount of dilution (to personal taste-variable) is reached. There are a number of web sites that show you how (check our Absinthe Links Section) and to get all your gear check La Maison d’ Absinthe . 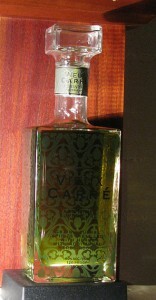 For other drinks such as a Death in the Afternoon, or a Sazerac, Vieux Carré mixes wonderfully and is a great cocktail absinthe. Bottle: Clear glass squarish decanter bottle with heavy bottom making it hard to tip over and lending a nice feel sharp shoulder and short neck with a glass stopper – much in the style of a early bar decanter. Printing is virtually impossible to read. Final Thoughts: Distillation is excellent, nicely complex, balanced, interesting absinthe that is well done. Price is amazing especially compared to many of the other artisanal absinthes on the market. Best absinthe out there for the money by far.